Many people ask me advice about their portfolio and CV and I always tell them to be creative to stand out of the crowd. This doesn’t apply to all kind of jobs, but when you’re talking about creative jobs, there are simply no rules on how to present yourself. Don’t mention the name of your kindergarden school, don’t mention you’ve been working at McDonalds during summer break. Believe me, nobody cares. And if your future employer does care, then he’ll select you on the wrong criteria. You don’t want to work for such a company. So get creative and make something awesome from your portfolio. Take the above portfolio as an example. Michael doesn’t show any of its works and still he succeeds in showing off his talent. Not only he can create great graphics, he also proves to be able to turn ‘boring’ facts and figures into something exciting. Well done Michael! 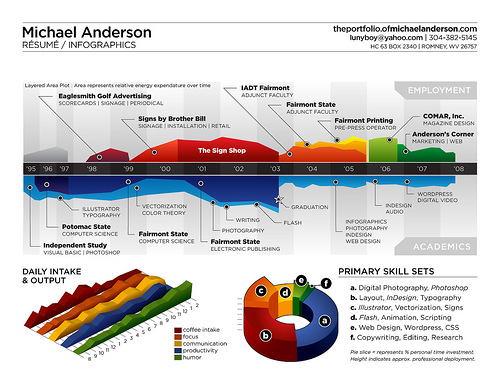 via Resume infographic on Flickr – Photo Sharing!.